Have any of you played in other bands? 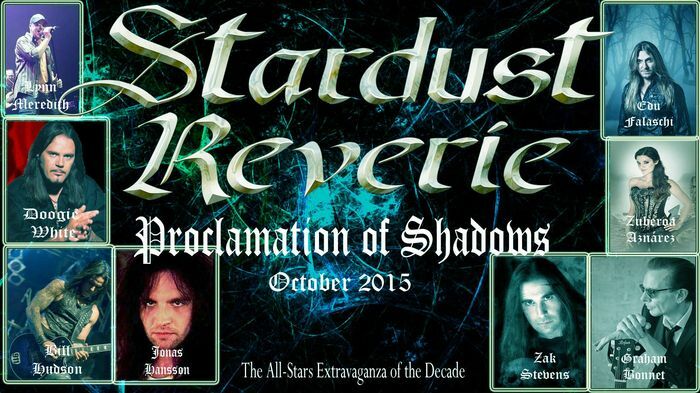 All of the Stardust Reverie members are part of well stablished bands like Rainbow, Savatage, Temple of Rock, etc. I am the only member that never performed with other musicians before. How is it that you started playing music? I am a writer of musicals. I started way back in 2005 with my first opera rock. It was so expensive to take it to the stages with a real good cast that I had to find a different way to take my music to the audiences so I contacted Steve Walsh. Graham Bonnet, Joe Lynn Turner and the rest of my all time heroes and it all started then. I formed an All-Stars project to give it a try to my music. What are your names? / Who plays what? / How old are you? Stardust Reverie are, among many others, Graham Bonnet, Zak Stevens, Lynn Meredith, Doogie White, Jonas Hansson, Edu Falaschi and Zuberoa Aznarez on vocals. I am 47 and play guitars. Have you had other previous members? Melissa Ferlaak. Did you make music even when you were young? I started writing when I was 11. Where are you from? Malaga City, Spain. Not as funny as Mega City One, I am afraid. What's your style of genre? Progressive Metal with folk influences. What inspires you? Comic books, horror films and literature. How often and where do you reherse? I never do it. Do you have other interests of work outside the band? Comic books writer and author. Are you looking for a booking agency, and what are your thoughts around that? Not at the moment. Are you looking for a label, and what are your thoughts around that? I have just founded my own label, Kuiama Records because I was unhappy working with other labels. What made you decide to make this music? Kharma, Destiny?... I don´t know. Everything happens for a reason. What are your songs about? Comic book characters, Literature and horror films. Who does the composing and writes the lyrics? I do both things. Do you start with the music or the lyrics? Always the music. Do you compose in a certain inviroment? It sounds typical but usually when I am shitting in the WC. Honest. I take a tape recorder with me because usually something comes out... well, something else, I mean. What are the least and most people to attend one of your gigs? We don´t play live. That´s why we are the Stardust Reverie PROJECT. When did you start to sell merchandise, and what do you have for sale? In 2014, T-Shirts and CD´s. What do you think about people downloading music instead of buying records now a days? I guess that if you really enjoy music you like to have a decent version of the album you are interested in. I would never hang a photocopy of a painting at home, I want a real painting on the wall, with the original colors. What do you think of my work? As a music journalist? We have to support each others business, I guess. Do you have any role models or idols? Ritchie Blackmore, Ian Anderson, Rory Gallagher and Jeff Lynne. Why do you think that they exist? Because they were genuine and unique. Is it easier to find inspiration from older bands, or bands that are more active today? For me, older bands. What have been your biggest obstacles? Being a perfect stranger to everyone in the business. What advice would you give other bands or artists? The one that Doogie White gave me once: make your best shot and become a lawyer. Do you have any new material? Always. How can people reach you? There is a Contact button on the website of the band. It leads to me. I can also be contacted via Facebook. What are your plans for the future? Reading as many comic books as I can. Do you have something to add? Thanks a lot for your time!